LAD Meeting: Wednesday, May 2! A packed agenda tackling this issue from several perspectives, including personal stories from student activists and community leader Tom Sullivan, who lost his son Alex at the Aurora shooting, and is now stepping up to run for HD37. Marta Moreno will speak to the tragic shooting of Longmont’s Jeff Cordova and Juan Louis Garcia in 1980, that gave birth to El Comité. We’ll have a short film with powerful messaging. We’ll give you a history of what gun safety laws have passed in Colorado, then outline what legislative work is still ahead of us and why voting with gun safety as a core motivation is critical to resolving this national crisis. We’ll finish the meeting with an action item directed to Senator Gardner ($3.8 million from the NRA) and Representative Buck ($800,000 from the NRA). PLUS: An update about the Northwest Rail and other transit issues effecting Longmont, with RTD Board Member Judy Lubow and Longmont City Councilwoman Joan Peck. You don’t want to miss this meeting…and please, bring a friend! 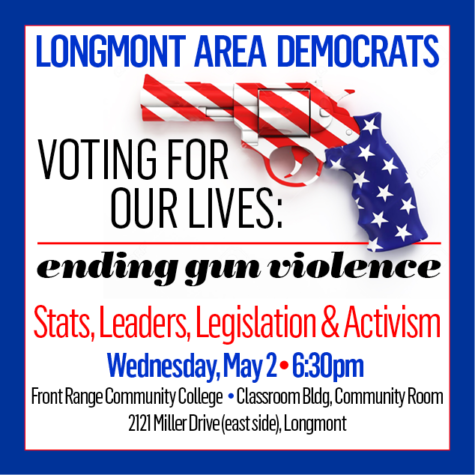 Wednesday, May 2, 6:30pm, Front Range Community College, 2121 Miller Drive, Classroom Building (east side of Miller Drive), Community Room. (go in door C4, go left, past the cafeteria, Community Room is on the right across from the bathrooms). Comments Off on LAD Meeting: Wednesday, May 2!